Packed with fiber, calcium, and iron, barley can help thicken soups and stews. Also, look for pearled barkey because it cooks quiker than unpearled. 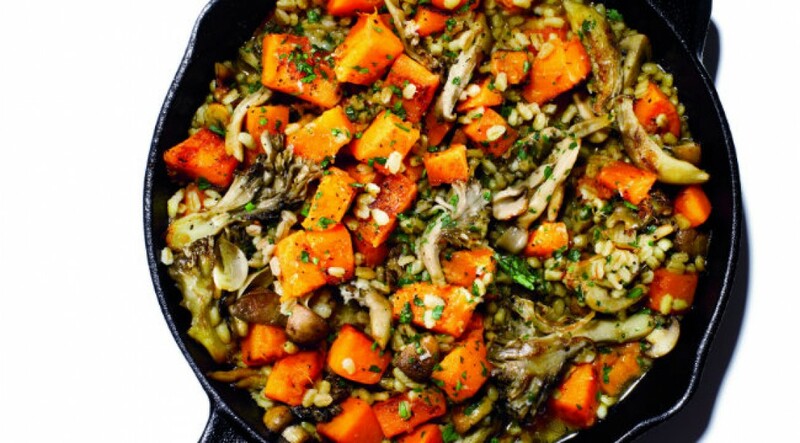 You'll be meeting your gains with Chef Irvine's wild mushroom and butternut barlotto recipe. Bring chicken broth to a boil and add the barley and bay leaf. Cook for 30-35 minutes. Spread on a sheet pan to cool. Peel the butternut squash. Cut off the bottom, split it down the center. Remove all seeds, then dice. Toss the squash with 2 tbsp olive oil, then place on a baking sheet. Cook in oven for 15–20 minutes. In a large sauté pan over medium-high heat, add 3 tbsp olive oil, shallots, and garlic. “Sweat” the shallots and garlic, then add mushrooms. Sauté until tender. Deglaze the pan with white wine (heat until sauce forms). Add chicken broth, barley, and squash and continue to cook over medium heat. Once the barley begins to thicken, add cheese and finish with fine herbs.